Traditionally, English daisy (Bellis perennis) has been considered an enemy of neat, carefully manicured lawns. These days, ideas about the function of lawns are changing and homeowners are realizing the many benefits of using English daisies for lawns. English daisy ground covers are easy to grow, environmentally friendly, and don’t require the extensive investment of money and time required by a traditional turf lawn. In fact, this lovely lawn alternative has become a staple ingredient in many flowering lawn seed mixes. Read on to learn more about Bellis daisy grass alternatives. Consisting of small daisies that twinkle against deep green foliage, English daisies are available in a variety of colors, and in both single and double forms. However, familiar white English daisies with contrasting yellow centers tend to be sturdier and are usually used in lawns. English daisy is suitable for growing in USDA plant hardiness zones 4 through 8. If you live south of zone 8, you may need a more heat-tolerant lawn alternative. Bellis perennis tolerates cold winters, but it struggles in hot, dry summers. English daisy is easy to plant from seed. You can purchase a commercial seed mix manufactured specifically for use as a lawn alternative, or you can mix English daisy seeds with lawn seed. You can also combine English daisy seeds with other flowering lawn alternatives. English daisy grows in nearly any type of well-drained soil and tolerates either full sunlight or partial shade. Plant seeds on well-prepared soil in late fall or early spring, then cover the seeds with about 1/8 inch of soil. Water the area lightly, using a spray nozzle to prevent washing out the seeds. Thereafter, watch the planted area carefully and water lightly whenever the soil appears slightly dry. This may mean watering daily until the plant germinates, which usually takes a couple of weeks. You may not see many blooms until the second year. Cut the grass whenever it gets too tall. 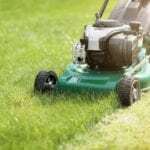 Set the mower to a fairly high level, and leave the clippings on the lawn to provide nutrients to the soil. Read more articles about Bellis Daisy.